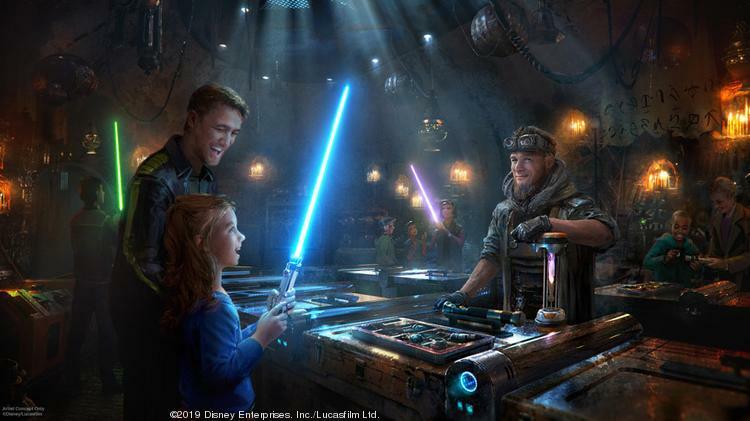 The new Star Wars: Galaxy’s Edge lands is giving up more secrets with each passing day – Disney have started to reveal juicy details about the guest experience so all of a sudden we are getting to know more about life in a galaxy far, far away. 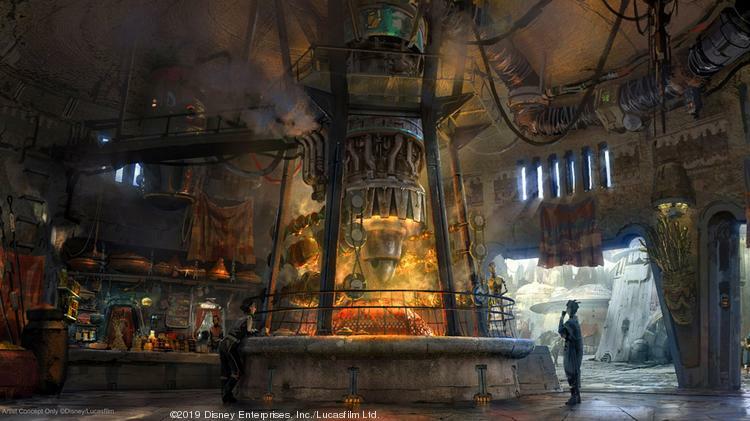 The land is set to put visitors on the planet of Batuu and in the Black Spire Outpost, a meeting place for all the good guys and baddies of this famed universe. The land will feature a pair of spectacular new attractions: Star Wars: Rise of the Resistance, a dark ride where guests are in the middle of a battle between the First Order and the Resistance; and Millennium Falcon: Smugglers Run, where a group of guests will have to work together to fly the iconic ship on a perilous mission. Ronto Roasters: A recycled pod-racing engine fires up a spit of exotic meats, meticulously turned by a former smelter droid, 8D-J8. Guests can even sample some of the tasty Ronto fare. Milk Stand: The place to go to get your farm-fresh blue milk or green milk, direct from Bubo Wamba Family Farms. Kat Saka’s Kettle: One of the many street market stalls, this grain vendor sells the ever-popular Outpost Mix (blend of sweet, savory and spicy popcorn). Dok-Ondar’s Den of Antiquities: For those in the know, Dok-Ondar is the Ithorian you seek for selling and buying rare and uniquely valued items from across the galaxy and spanning all eras. Savi’s Workshop – Handbuilt Lightsabers: Guests come to the workshop to meet with the Gatherers, a secretive group of people who have dedicated their lives to restoring balance in the galaxy by passing on their knowledge of Jedi lore and the Force. The workshop Master guides guests to customize and build their own unique lightsabers, and instructs them on the ways of the Jedi. Droid Depot: Visitors to Mubo’s workshop can choose parts and construct their own individual astromech droids to accompany them on their journey, and then take them home with them. First Order Cargo: A spaceport hangar bay serves as the temporary base and landing spot for the First Order. First Order officers have brought in crates of gear, uniforms and other supplies to win the hearts and minds of locals and visitors to Black Spire Outpost. Resistance Supply: Resistance members and local sympathizers oversee a makeshift stall that supplies Resistance uniforms, pins, badges, hats, helmets, jackets, maps, tools, training supplies, food rations and other items. Other merchandise stops include: Toydarian Toymaker, a place filled with unique toys; Creature Stall, a place to find that perfect creature friend; Black Spire Outfitters, a clothing stop; and The Jewels of Bith, an accessories shop. Orlando’s version of the land is set to debut fall 2019, and will apparently look like it was just plucked straight out of a “Star Wars” film. This new world will have inhabitants from various planets, recognizable vehicles and is purported to be a living, breathing environment that responds to how guests perform on rides. Just crashed the Millennium Falcon into a cliff? Reports say that some characters will be able to have unique responses for those rusty pilots on how they might improve their driving!